Generic Manufacturing’s fully Sleeving Machinery is designed to apply shrink label sleeves and tamper evident banding applications up to 200 containers per minute (cpm) dependent on package size, shape and film composition. Our sleevers are designed and built in the USA out of the highest quality components in order to keep your packaging line running strong, and your employees safe. 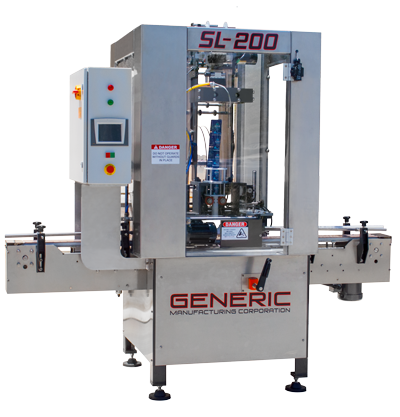 The SL-200 is our top-of-the-line sleeving machine capable of running up to 200 containers per minute depending on label and container size. It is precise, smooth, and fully automatic. Click Here for Full Specs!